Botanic gardens and arboreta located on college campuses uniquely present opportunities to serve as beautiful retreats, cross-curriculum outdoor classrooms, and research havens. Terra’s long-standing involvement with academic landscapes over the years has given us valuable insight into how to seamlessly blend these three purposes in one inspiring setting. The Lewis and Clark Community College occupies 200 acres of rolling land, half of which was the original campus for the Monticello College, a prestigious women’s college founded in 1838. The design of the original campus evokes age and history; stately stone buildings nestled among century-old trees promote feelings of quiet strength and serenity. In contrast, 21st century needs for facility expansion, competition for students and faculty, and a strong desire to be stewards of the environmental and natural resources has resulted in a campus that has become bisected. The challenge from a campus site planning perspective is to blend the two zones of the College into a cohesive and fluid experience. To that end, Terra Design Studios designed the Master Landscape Plan to link the old with the new. Design goals included a better definition of portals to bridge the gap between campus zones; the addition of nodes in the landscape to encourage sitting, interaction and socialization; and integration of landscape elements to weave nodes, portals and links together. 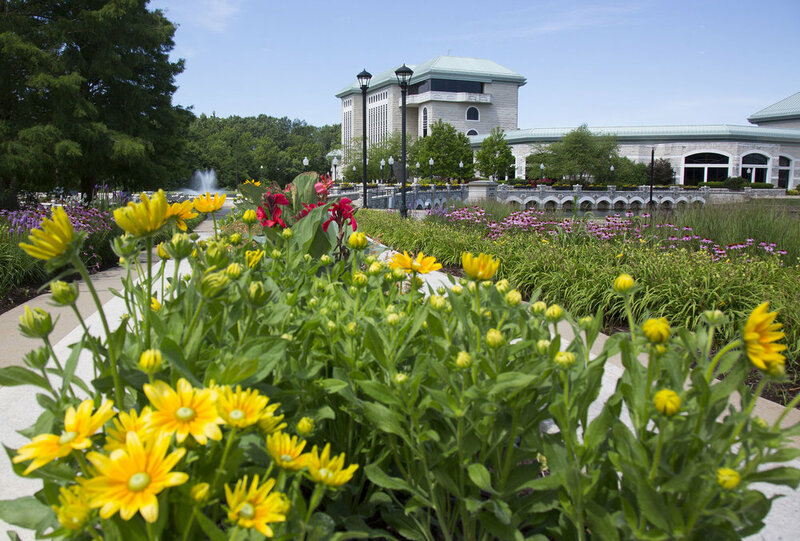 The entire campus has been designated a Missouri Botanical Garden Signature Garden. 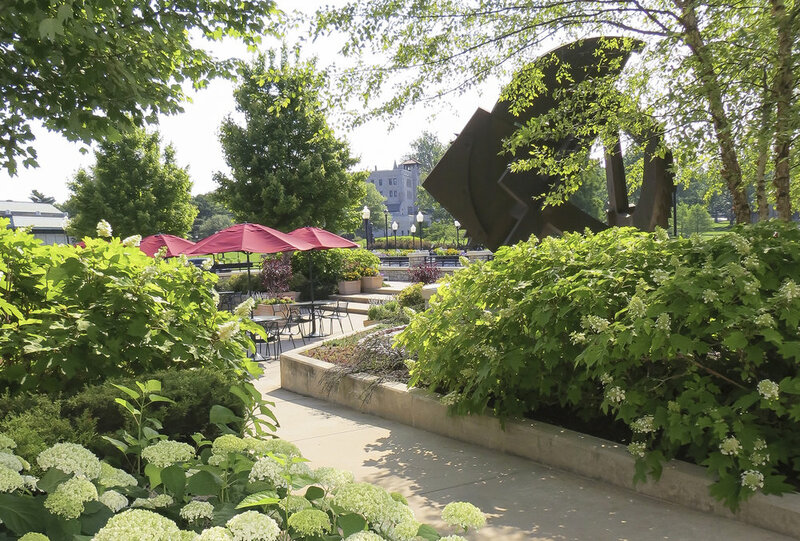 Dedicated in 2004, the Rivers of Color garden flows around and through a major pedestrian thoroughfare on campus; it was the first Signature Garden installation of the Master Plan. Many others have followed so that this major corridor is completely planted in a themed landscape, punctuated by iconic bronze sculptures. Terra’s involvement at Lewis and Clark Community College has spanned over fifteen years of continuing service. Our scope has been broad, from the development of a Master Landscape Plan to the design of the core campus as a major sculpture park. Additionally, Terra has helped grow the College’s commitment to sustainability through the 2009 construction of a major green parking lot drained by bio-swales, lit by “dark-sky” LED lights, and shaded with native trees. A quarter-mile “Eco-road" was constructed in 2013, which included porous pavements, LEED compliant lights, and traffic calming measures that are critically needed on this major vehicular throughway. Through a significant Illinois Green Infrastructure Grant Award in 2015, LCCC was able to construct a major artful rainwater system to cleanse, cool, and slow down the storm water runoff from 5 acres of parking lots before it reached the headwaters of China Creek, and eventually into the Mississippi River. A major donation for a new education center at the Arboretum spurred leadership to revisit the existing 2002 Master Plan. To fully understand their intent for the Arboretum, Terra led an initial master plan charette with the stakeholders in 2015, and we returned to present master plan options. The resulting updated Master Plan focuses on visitor experience, wayfinding and the design of a distinct garden zone which will be nestled within the mature tree collections. A primary focus of the Master Plan update is the Walk Across Kentucky — seven re-created micro-ecosystems that have been created along a two-mile trail within the Arboretum. 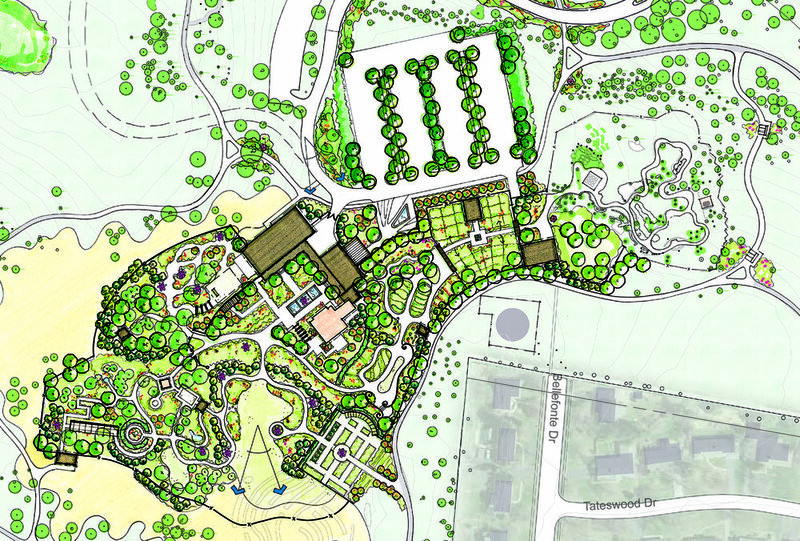 The Master Plan suggests improved interpretation, nature gardens, and trailheads. These nature gardens will have a stronger focus on specific plant species native to each region, to introduce visitors to authentic ecosystems. The Master Plan also suggests the creation of a centralized and succinct botanical garden, which will fund much-needed additional staff for the Walk Across Kentucky through admissions, memberships and rental income. The botanical garden design includes the Tree Terrace and fountain to welcome guests to a new Visitor Center and Education Center, which embraces the Four Seasons Courtyard. The botanical garden will also include new Home Inspiration pocket gardens, the Garden of Good Taste, the Kentucky Children’s Garden, and the “Triple Crown” Garden. 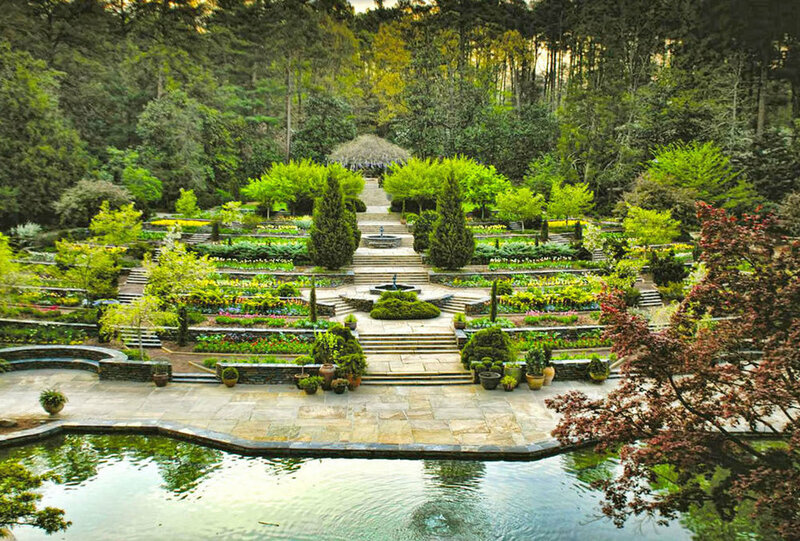 Cindy Tyler completed the Master Plan for Sarah P. Duke Gardens in 2004 while a partner at MTR. The Plan was strongly based upon improving pedestrian circulation; many of the historic places in the Gardens were not accessible, and the nine gateways from campus to the Gardens presented wayfinding challenges. Other goals for the Master Plan included establishing conservation zones for the wooded spines in the Gardens, protecting the existing cherished iconic gardens, such as the Terrace Gardens, and determining what new gardens should be added to the already robust Gardens’ menu. Terra was asked to return in 2010 to evaluate the progress of the Master Plan Implementation. We spent time in the Gardens observing the physical construction progress and talked at length with staff, University administrators, and other stakeholders to assess the relevance of the original Master Plan. To maintain and advance cultural relevance to their visitors, Terra prepared a Five-year Priority Action Plan for the Garden that included overlays to the original Plan to demonstrate how to locate and integrate emerging topics, like children and family engagement, edible gardening, artful stormwater management and sustainability into the gardens. The Gardens’ 55 acres are visited by more than 300,000 people annually, and offer educational opportunities for adults, children, families and more! In 2010, Terra Design Studios and interpretive planners The Acorn Group were commissioned to prepare an Interpretive Master Plan for this 200-acre garden gem nestled in the Ouchita Mountains. Garvan Woodland Gardens has a rich past and an equally compelling future; the storylines are varied and complex. It was our task to tease out the strongest strands and develop an overarching theme so that the messages and media would guide not only the visitor but also the Gardens’ future development in a meaningful and innovative way. Garvan Woodland Gardens is the legacy of Verna Cook Garvan, who bequeathed the land to the University of Arkansas upon her death in 1993. It is an oasis of naturalized gardens, native environments, stunning geologic formations, ever-present water, and one of the largest collections of E. Faye Jones architecture in the country. However, for all it has to offer, visitors often leave the Gardens without a message that embraces the essence of the place. We were charged with developing an interpretive package that uncovers the heart of the Gardens, yet does not disrupt the visitor experience through an overabundance of interpretive signs. The goal was to create a well crafted message, and have the manifestation of that message woven into a carefully choreographed visitor experience. McCrory Gardens, 25 acres of display gardens and a 45-acre Arboretum, evolved without a master plan since its inception, and as a result the existing collections and displays lacked a unifying theme or message. Terra Design Studios and interpretive planners The Acorn Group were called upon in 2010 to prepare a Master Plan for the Gardens and Arboretum, and one of the first orders of business was the exploration of relevant themes to the Gardens and the University. We conducted a series of charettes with students, faculty and the community to inspire new garden spaces. As a Land Grant University, the participants had a strong desire for the Gardens to showcase the unique heritage and the future of agriculture in the High Plains, and provide demonstration gardens as models for families to replicate at home. To that end, Terra developed a signature collection of gardens, the Heritage Gardens, which expresses the individual relationships that Native Americans, European settlers, and plant explorers such as N.E. Hansen had with the challenging short-grass prairie environment. The Heritage Gardens are beautifully-designed vignettes that, through striking horticultural displays, sensory stimulation and spatial complexity, connect visitors to their past while informing their future. Terra also worked with plant ecologists and landscape architects from the University to develop restoration plans for the native prairies, including unique regional features such as moraine topography and improvements to ephemeral water courses that bisect the Arboretum. Based on the site’s capacity and University stakeholder goals, the original Master Plan was designed by Cindy Tyler while a partner at MTR. Seventy of the Arboretum's 125 acres are occupied by a mature oak-hickory forest, where University students study transects of the woodland regime. The remaining 55 acres feature terraced display gardens and naturalized collections of shade loving plants in a secluded valley embraced by steep slopes and hilltops with commanding views. The master plan focused on the valley, to create areas of respite balanced by colorful display gardens. 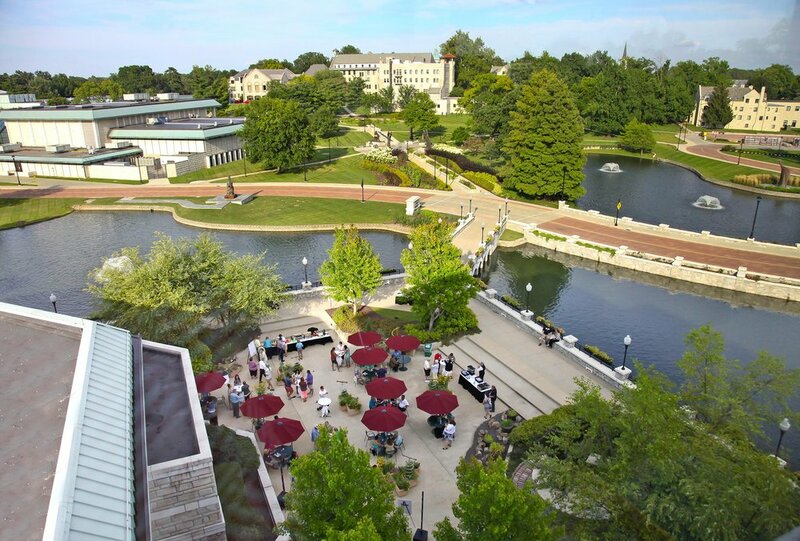 In 2010, Terra was called back to help the University evaluate development priorities through the design of an updated Master Plan. University representatives and a non-University Advisory Committee were consulted to ensure both audiences’ needs were met. The Valley Floor Gardens, which offer a diverse collection of sun and shade plants and showcase the artful stormwater management exhibit that cuts through the lowlands, were chosen for early implementation. As part of an effort to attract more families to the Arboretum, The Family Garden targets a pre-school audience at the north end of the Arboretum. Winding valley paths guide guests to Sycamore Flat at the Arboretum’s center, where a magnificent stand of mature sycamore on the valley floor hosts a treehouse village, intriguing to older youth. The dramatic landscapes and spectacular woodlands of Edith J. Carrier Arboretum are a sought-after oasis on campus and for visitors from the surrounding Harrisonburg area, but they also serve as a rigorous outdoor learning laboratory for university students.